Join us as we help one of our local charities, Tara Hall, kickoff their annual paddle fest. It’s a great time to spend with family and friends! Online Registration for Paddle Fest is open now. CLICK to sign up to paddle or attend. Paddle Fest event details HERE. We are still seeking Event Sponsors! CLICK to sign up to sponsor. There is still time to receive full sponsorship benefits, even at this year’s special STAR LEVEL. See all sponsorship opportunities HERE. Prefer to mail in your registration or sponsor forms? Need a flyer to share? 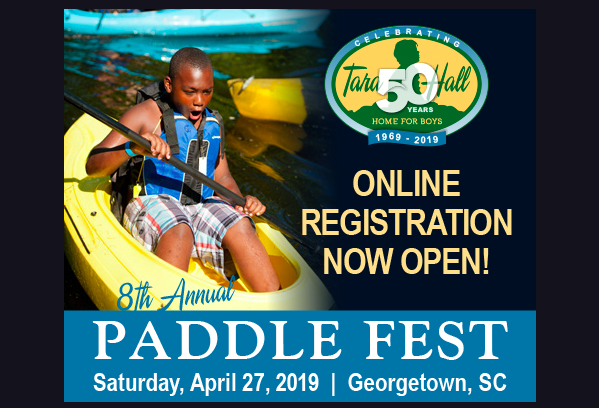 CLICK HERE for all of the Paddle Fest printable forms and information. Join us Friday night for a FREE Live Performance by Jimmy Wayne. with a celebrity guest & free live performance! Award-winning recording artist, speaker and best-selling author Jimmy Wayne is joining us at Paddle Fest and performing at a FREE “Evening for the Community” the night before. This event is a THANK YOU to the community from Tara Hall for 50 years of support!